Western Greyhound bus drivers arriving at work on Friday morning have spoken of their shock and surprise after being greeted with a letter telling them they no longer had jobs. The letter, signed by managing director Michael Bishop, speaks of his "deep regret" at the news, claiming the company had been forced out of business after failing to secure fleet insurance for its buses. Mr Bishop wrote: "I think it is important that you understand why this has happened because I believe in openness, honesty and transparency. "As you may be aware, I rescued the company on 10 December 2014 and since then there have been many hurdles which we have worked hard to overcome. Mr Bishop went on to say that the cost of fleet insurance had increased dramatically and as a result the finance company had refused to provide the money. The insurers had demanded an upfront payment which under the circumstances was impossible. Transport union RMT has reacted with dismay to the shock collapse of Western Greyhound, revealing that just 24 hours before the announcement it was in negotiations with the company over improving staff pay and job security. The union said its representatives had met with Western Greyhound management to discuss their future plans, and the company had given "no indication" that there were problems with the business. Western Greyhound has been called to a public enquiry before the Traffic Commissioner later this month. A spokesman for the government regulator said the hearing would take place in Bristol on 23rd and 24th March. The news comes hours after the company announced it would cease trading. A spokesman for the Traffic Commissioner said: "I can now confirm that the company has been called to a public inquiry before the Traffic Commissioner for the West of England. This will take place on 23 and 24 March, commencing at 10:30am on the first day. Replacement bus services to cover Western Greyhound routes will not start until after the weekend the council has confirmed. Cornwall Council's passenger transport team has been working with the bus industry to arrange alternative services. The council said several companies have agreed to provide the majority of Western Greyhound routes starting from Monday March 16. A council spokesperson said: "Four companies have agreed to provide the majority of services from Monday and so it is hoped that, for the main part, disruption to the general public will be kept to a minimum. Click here here to see an interview with Western Greyhound director Michael Bishop where he explains why the company folded. 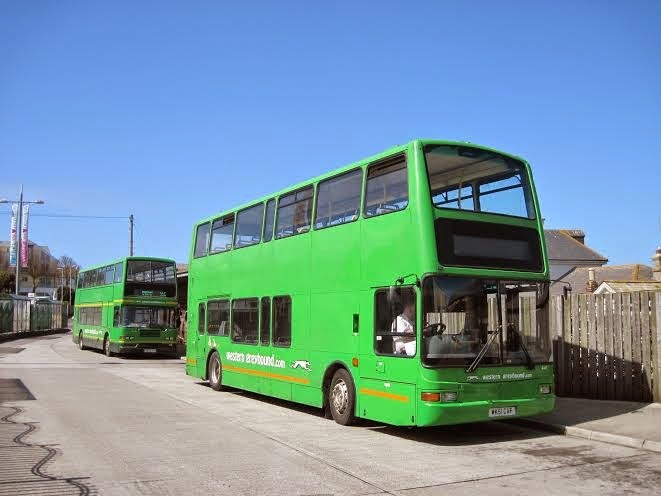 The Cornwall Council website states that timetables for the replacement services, operating from Monday 16 March, are available on the following bus operator websites.